Mercedes will rent out the GLC F-Cell (shown) at 799 euros ($917) a month. FRANKFURT -- Mercedes-Benz will soon start handing over its latest fuel cell car to fleet customers to keep a toe-hold in a promising technology that has been hampered by the difficulties of storing and refueling hydrogen. The Mercedes-Benz GLC F-Cell model combines a fuel cell with a battery that can be charged via a wall socket, easing driver concerns about refueling. For now, the automaker will rent out the vehicles at 799 euros ($917) a month in Germany, with drivers returning the car at the end of the full-service contract. The real-world test will help refine the technology, Mercedes parent Daimler said. As a next step, Mercedes plans to offer the vehicle in Japan. "Regarding costs and standardization, we have not reached the goal yet, but we are heading in the right direction," Juergen Schenk, the head of Mercedes-Benz electric-drive system integration, told reporters in Stuttgart this week. "Fuel cells will see a breakthrough - whether that is going to be in cars, vans or buses remains to be seen." Fuel cell technology, which emits only water vapor in cars, has struggled to gain traction because of high costs, complex storage of hydrogen and a lack of infrastructure. Toyota, the main proponent for hydrogen cars, and Hyundai both offer vehicles commercially. Toyota's home country of Japan is investing heavily in building hydrogen-fueling infrastructure as it prepares to showcase the technology at the 2020 Olympic Games. Other automakers such as BMW are working on prototypes that could offer better driving ranges for larger electric vehicles. Volkswagen Group's Audi brand is considering a small-scale production of fuel cell cars in 2020. Infrastructure in Germany, Europe's largest economy, remains patchy. A joint venture dubbed H2 Mobility, which includes Daimler, Linde, Royal Dutch Shell and Total, plans to have around 100 hydrogen fueling stations across the country by next year. That number could roughly quadruple by 2023, according to Daimler. Fuel cells convert chemical energy into electricity through a reaction of hydrogen with oxygen or another oxidizing agent. Mercedes's model, with a driving range of 478 kilometers (297 miles) for fuel cell and battery, takes about three minutes to replenish the tank. 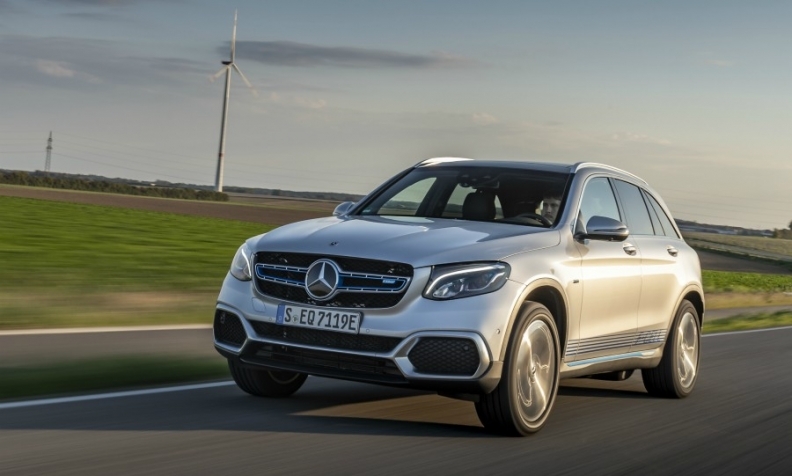 Mercedes last month unveiled the brand's first all-electric vehicle, the EQC crossover, as part of a push to roll out 10 purely battery-powered vehicles by 2022. The division expects all-electric cars to account for between 15 percent and 25 percent of global deliveries by 2025. While full-electric or fuel cell cars do not emit any emissions on the road, it is another story during their manufacture, Schenk said. Energy demands for production of cars with fuel cells or high-voltage batteries trigger significantly higher emissions of carbon dioxide, a contributor to climate-warming, he said. During the life cycle on the road, plug-in hybrids can save emissions of as much as 55 percent compared to combustion engines, even if the electricity for charging the battery does not come from renewable energy sources. "That is reason enough for us to believe that this technology will have a long future," Schenk said.